Happy summer! The weather has been warming up, so I’m getting ready to finally tackle a fully-painted build. I’ve been planning for ages to redo a Z’Gok in colors that remind me of Miami. 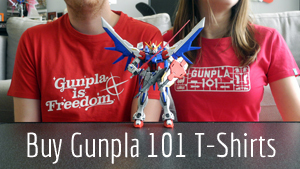 Also this summer: Gunpla 101 is putting this show on the road. We’re going to be presenting four panels at AnimeNEXT as guest panelists, and three of them are about Gundam. F91 is getting spoiled this summer. This new version gives the Master Grade a much-needed update that uses the latest in Bandai’s PlaMo technology. It also comes with two expanding railguns, multiple heads, and can be fitted with an optional LED unit to make it glow inside. Just like Momo’s first Build Divers avatar, this Haro is pink with cat ears. I’m not above thinking it’s freaking adorable. At $6, it probably isn’t very large or complex. I never thought Kapool looked like a penguin before, but Momo has changed my mind about that. My guess is that Bandai wants this simple, cutesy kit to be the next Beargguy. Momo is cute and all but as a character she is less developed than China or Rinko Iori, or even Fumina or Gyanko. I want to get to know her a little better before I buy her Petitgguy. As usual, the main mecha of the series is going to go through several iterations. After Riku decides to rebuild his gunpla, it ends up looking like this. Compared to his old Gundam 00 Diver, the shoulders are even more ridiculous. Inspired by the Gn-X IV first seen in Mobile Suit Gundam 00 The Movie: Awakening of the Trailblazer, the Ogre has a red paint job that screams “I’m used by an antagonist who might become your ally later on!” The modular Ogre Sword is pretty cool. Don’t think you can build this one as well as its fictional creator Shahryar, who is said to be the most talented builder in the Build Divers universe. Bulky yet sleek, the coolest part of this kit is that it can transform its arms and legs, giving it a totally different look. Allegedly this helicopter backpack works with any HG Build Divers kit, but its color scheme most closely matches that of Rommel’s Grimoire Red Beret. This is certainly more exciting than the average set of extra parts, which is usually hands and swords and stuff. Straight from Gundam Wing, this grunt unit has gotten its first 1/144 kit, and its early appearance in Gundam Build Divers meant I probably should have expected that.